Tree removal is and always will be an important part of our service offerings to our clients. If you’re looking for a company that is a cut above the rest Atlanta Arbor is the company for you. We are not just your average “tree cutters”, we are trained Arborists and specialists in our field, and we value trees. Tree removal is sometimes a necessity as in situations when the tree is dead or dying; if its roots are impacting sewers, pipes, or foundations; if the canopy is in a state of decline that makes up greater than 30% of the canopy; or if the tree has been damaged by a storm beyond saving. Atlanta Arbor has an objective to look for the best alternative for your situation. Removal is looked at as a last resort, and most of the time we are able to come to a solution through one of our many other services such as pruning, cabling, or through our plant healthcare program. Unfortunately, there are times when it is necessary for trees to come down, and when that’s the case you want to protect your family and home by hiring a responsible and professional company. When removal is the case, Atlanta Arbor will carefully evaluate each individual situation and choose the appropriate way to get your tree to the ground quickly and safely. 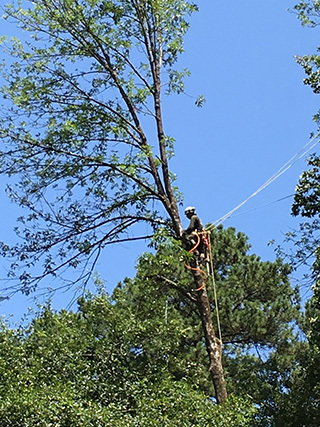 Some of the techniques used for tree removal that we practice are technical rigging, progressive climbing, crane removal, or bucket truck removal. Because of our direct access to the use of a crane, we are able to offer very competitive pricing, and our crew is well versed in the method of crane removal. Cranes are primarily used in situations where it is not advantageous to the client for removal by other methods and is a great solution for some of the more difficult situations. Tree removal is not for the faint of heart, it is a very involved and potentially dangerous job. This process requires a high level of skill, a great deal of sound judgment, and quality equipment to complete the job safely and efficiently. Tree work is one of those industries where you get what you pay for. Don’t fall victim to the allure of a price that seems too good to be true, or hire an amateur that doesn’t know what they are doing. Hire a true professional to do the job right and ensure the safety of you and your property!